Ellie definitely helped with this one. I like to think she was adding a little David Bowie makeup to this cat. She's so hip. Somewhere in the throws of adulthood, I forgot how completely calming and therapeutic the art of coloring in a coloring book is. The scent of waxy crayons, the ability to be thoughtlessly creative....it's as soothing as a glass of wine. [Tangent: You get to pick the color palette and the picture to color, but there is no stress of how to go about it or how perfect it is...you just are on autopilot for about 30-45 minutes, and it is spectacular. Not to oversimplify, but I daresay that if the folks in the Ukraine were tossed some boxes of crayons (like at least a 65 count) and some coloring books, tensions would ease considerably.] Because of my new discovery, I of course decided to buy some coloring books at Target last week, because frankly, every grown woman trying to remain sane and balanced should. Luckily Lisa Frank stuff was in the dollar aisle so I could use every last color in my new box of 96 crayons. yep. These street-wise teddy bears took my stress down about 40 notches! But this isn't even the point of this blog [Tangent: I know. I know. I bury the lead...a lot. Story of my life.] The thing I felt the need to share with you weirdos is that there is currently a cool bonus to buying crayola crayons. 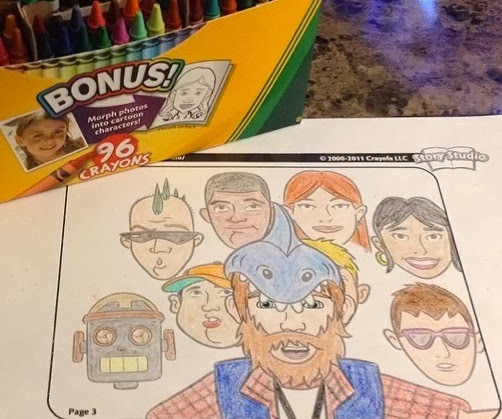 With a code inside each box, you can be the "star" of your very own coloring book as part of their Story Studio campaign. DREAMS DO COME TRUE! [Tangent: I realize this crayola campaign is mainly marketed at parents of young children, but damn...why do they get to have all the fun?!? Who says I (as a childless 31 year-old) don't want need to be the center of a completely ridiculous storytime adventure that I can later articulate with color, while trying to calm myself while watching 12 Years a Slave? Because I DO!] I tried to upload a picture and then see if it looked like me, but it didn't come out so fantastic. My results made me look a little like a demonic child, so I just decide to start from scratch and form my old "character" Mr. Potato head style by choosing features similar to my own and making a composite. When tasked with choosing my own adventure scenario, I, of course I decided, to place myself into a haunted house setting. 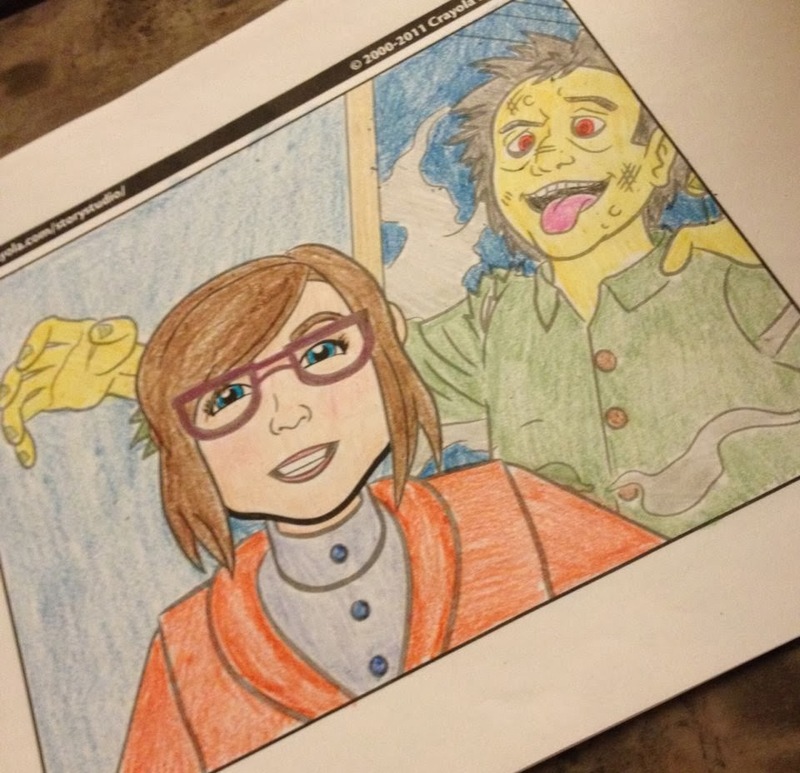 Here's my newly colored avatar looking ecstatic that a jaundiced zombie is lurking. While my 30 day free trial lasts, I am halfway tempted to make a homemade coloring book for everyone in my life....I'm starting with Jamie and working my way down the list. how amazing! make me a page! oh, it's in the works!!! 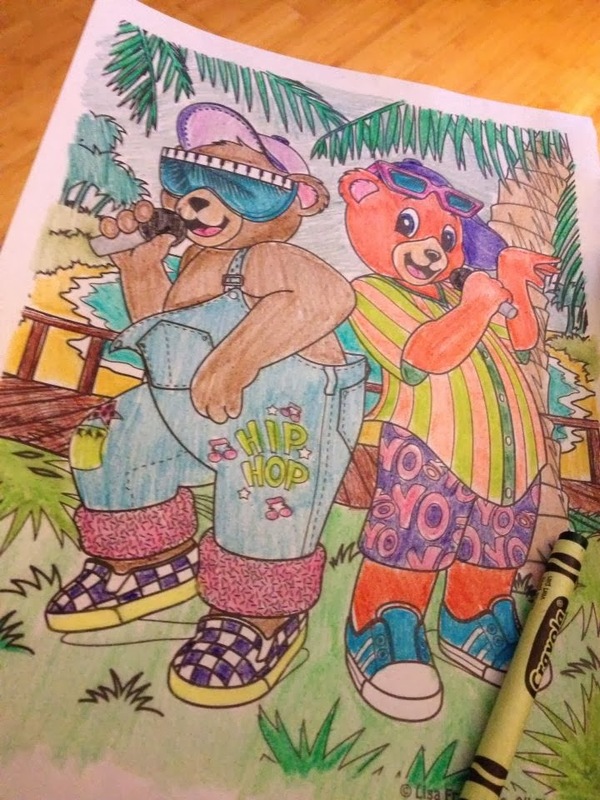 I feel like every blogger needs a coloring book! This might be life-changing. I love it! I'm so glad! Crayons are like $5 for a huge box and definitely worth it for all the options! Since writing this, I had made 3 coloring books for other people, and realized that you can really customize them to ridiculous avail. Ex: If the "story" is about a big race, you can decide whether the person is gonna ride a horse, a motorcycle or a lion. I picked a lion...obviously. I NEED TO DO THAT! Seriously...I am always looking for DIYs to post on the Nerds and Nomsense blog I contribute to....I may have to do this. you definitely should. I know it is really juvenile, but it is really calming.